Boys win MAC Red Dual Meet championship with a perfect 14-0 record!! The girls finish 6-1 on the day for a season total of 11-3 (Best in school history in the MAC Red). The Team was led by Kayla Dobies, Monica Micale, Hannah Faustyn and Izabella Gowen. 18 girls set personal records and 11 more ran their season best time. The boys finish a perfect 7-0 for a 2nd jamboree and complete their undefeated dual meet season (14-0). Chase Fedolak, Mitch MacDonald, James Hoefler and Brendan Koch lead the team. The boys JV team also won!! Lead by Josh VanSlambrouck and Colin Swanson. ​19 boys set personal records and 15 men ran their best time of the year. Déjà vu, only in a different locale. It was like watching a rerun, only on a different channel. Once again, L’Anse Creuse North’s Karenna Duffey and Adam Fraeyman of Romeo were individual champions at a MAC Red jamboree. 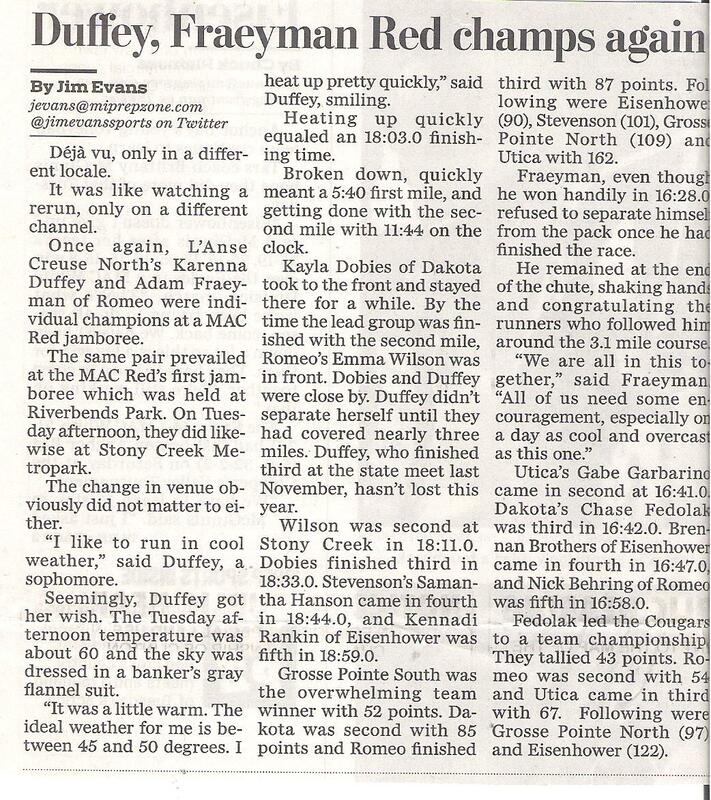 The same pair prevailed at the MAC Red’s first jamboree which was held at Riverbends Park. On Tuesday afternoon, they did likewise at Stony Creek Metropark. The change in venue obviously did not matter to either. “I like to run in cool weather,” said Duffey, a sophomore. Seemingly, Duffey got her wish. The Tuesday afternoon temperature was about 60 and the sky was dressed in a banker’s gray flannel suit. “It was a little warm. The ideal weather for me is between 45 and 50 degrees. I heat up pretty quickly,” said Duffey, smiling. Heating up quickly equaled an 18:03.0 finishing time. Broken down, quickly meant a 5:40 first mile, and getting done with the second mile with 11:44 on the clock. Kayla Dobies of Dakota took to the front and stayed there for a while. By the time the lead group was finished with the second mile, Romeo’s Emma Wilson was in front. Dobies and Duffey were close by. Duffey didn’t separate herself until they had covered nearly three miles. Duffey, who finished third at the state meet last November, hasn’t lost this year. Wilson was second at Stony Creek in 18:11.0. Dobies finished third in 18:33.0. Stevenson’s Samantha Hanson came in fourth in 18:44.0, and Kennadi Rankin of Eisenhower was fifth in 18:59.0. Grosse Pointe South was the overwhelming team winner with 52 points. Dakota was second with 85 points and Romeo finished third with 87 points. Following were Eisenhower (90), Stevenson (101), Grosse Pointe North (109) and Utica with 162. Fraeyman, even though he won handily in 16:28.0, refused to separate himself from the pack once he had finished the race. He remained at the end of the chute, shaking hands and congratulating the runners who followed him around the 3.1 mile course. It was a fantastic touch by the Romeo senior captain. The Bulldogs hosted Tuesday’s jamboree. “Sportsmanship is something captains like Jason Saliga and Andrew Nelson emphasized when I was younger runner on the team, and that stuck with me,” said Fraeyman. Fraeyman’s common touch following the race contrasted sharply with his uncommon ability during the event. He stayed back for the first two miles, pacing teammates and trying to get them to earn personal records. But, at two miles, he separated himself. Utica’s Gabe Garbarino came in second at 16:41.0. Dakota’s Chase Fedolak was third in 16:42.0. Brennan Brothers of Eisenhower came in fourth in 16:47.0, and Nick Behring of Romeo was fifth in 16:58.0. Fedolak led the Cougars to a team championship. They tallied 43 points. Romeo was second with 54 and Utica came in third with 67. Following were Grosse Pointe North (97), Eisenhower (122), Grosse Pointe South (158), Stevenson (214) and L’Anse Creuse North (217). The Macomb County meet will be at Stony Creek Metropark on Saturday, Oct. 17. 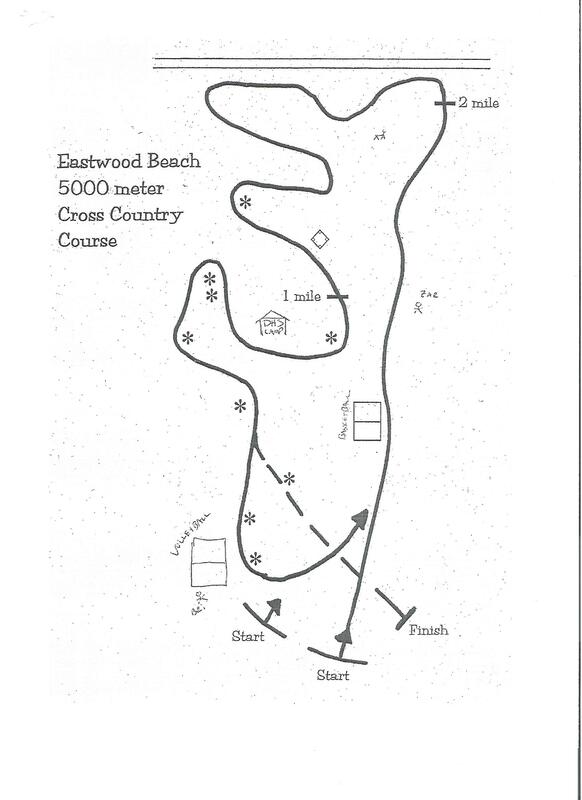 On the following weekend, the MAC Red Division meet will be run at Lake St. Clair Metropark. Regional meets will be held the last weekend of the month.